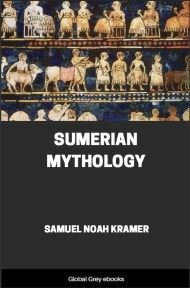 Chapters include: The Official Life of an Egyptian Officer; Hymn to Osiris; The Synchronous History of Assyria and Babylonia; Inscriptions of Shalmaneser II; The Monolith Inscription of Shalmaneser II; The Inscription of Shalmaneser II; A Votive Inscription of Assur-Natsir-Pal; Inscription of Rimmon-Nirari III; Votive Inscriptions; Babylonian Contract-Tablets with Historical References; The Dedication of Three Babylonians to the Service of the Sun-God at Sippara; The Great Inscription of Argistis on the Rock of Van; and, Monolith Inscription of Argistis, King of Van. 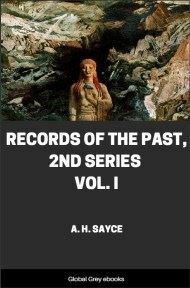 Thanks to my contributors, I have this year been able to redeem my promise of issuing two volumes of the Records of the Past during the same season. 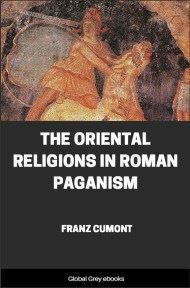 The monumental records of the ancient oriental world are so numerous, and so much new material is continually being brought to light, that it is difficult for either contributors or editors to keep pace with the discoveries that are constantly being made. All we can hope to do is to lay before the public the most important of the documents which have thus been rescued from forgetfulness, and the latest and most authoritative renderings of the texts. The latest discovery of interest to the student of the Old Testament has been announced from Berlin. Among the tablets from Tel el-Amarna which have been acquired for the Museum at Berlin, five are found to have been despatches sent from the king or governor of Jerusalem to the kings of Egypt. I had already recognised the name of Uru’salim or "Jerusalem" in a tablet now in Cairo (Academy, 19th April 1890, p. 273); the tablets at Berlin give us further and unexpected information in regard to the later capital of the Judæan kingdom. In the fifteenth century before our era Jerusalem was governed by a certain Abdi-dhaba, or Ebed-tob as his name would have been written in Hebrew; and it is his letters which have just been deciphered by the German Assyriologists. He claims to have occupied a more independent position than the governors of the other cities of Palestine at the time. They were merely Egyptian officials, whereas he, though owning allegiance to the Egyptian monarch, claims to have been appointed to his office by "the oracle of the mighty king." This "mighty king" is shown by one of the despatches to have been the deity who was worshipped at Jerusalem. Abdi-dhaba, accordingly, must have been a priest-king like Melchizedek, "the priest of the most high God." A broken tablet which I copied in M. Bouriant's collection tells us what was the local name of the deity in question. Here we read: al sad Uru’salim-KI al bit AN NIN-IP: sumu Mar-ruv al sarri padarat asar nisi al Kilti-KI," the city of the Mountain of Jerusalem, the city of the temple of the god Uras, (whose) name (there is) Marru, the city of the king, defending (?) the locality of the men of the city of Keilah." Consequently "the most high God," of whom Abram was blessed, was locally known under the name of Marru, which seems to be connected with the Aramaic marê, "lord," and was identified with the Babylonian Uras, the Eastern Sun. It is possible that the name of the god may throw light on that of Moriah, "the mountain" on which his sanctuary was erected. Abdi-dhaba describes himself as having had dealings with the Kassi or Babylonians, and in one of his letters he says: "so long as a ship crosses the sea—this is the oracle of the mighty king—so long shall there be a continuance of the conquests of Nahrima and the Babylonians." Nahrima represents the Aram Naharaim of Scripture, and it is interesting to find that the conquests of a king of that country were known and feared in southern Palestine a hundred years before Israel was oppressed by Chushan-rish-athaim, the king of Aram Naharaim (Judg. iii. 8–10). The mention of the Babylonians is also interesting since Manetho avers that when the Hyksos were expelled from Egypt they built Jerusalem as a defence against the "Assyrians." In the age of Manetho "Assyrians" and "Babylonians" were synonymous terms. While we are thus learning the inner history of Palestine in the century before the Israelitish invasion, the history of the fall of the Assyrian empire, late as it comparatively is in time, is still shrouded in obscurity. Two new facts only have been acquired of recent years in regard to it. One is that the Assyrian king whose name was doubtfully restored as [Bel-sum-]iskun was really called Sin-sar-iskun; the other is that Assur-etil-ilâni-yukinni, the son and successor of Assur-bani-pal, was acknowledged in northern Babylonia as late as the 4th year of his reign, tablets of that date having been found at Niffer by the American expedition. Since Sin-sar-iskun seems evidently to be the Sarakos of Abydênos and Alexander Polyhistor, we must regard him as the last king of Assyria, of whom it was said that he had burnt himself to death in his palace. But between Assur-etil-ilâni-yukinni and Sin-sar-iskun it would appear that there was at least one king, possibly two. A tablet (K 195) was discovered by Mr. George Smith from which he translates the following passage: "Sin-inadina-pal son of Assur-akh-iddin (Esar-haddon), king of Assyria, whose name on this tablet is inscribed, to the government in the earth, in the presence of thy great divinity Shamas great lord, he is proclaimed and established." The name of Sin-inadina-pal, or rather Sin-iddina-pal, reminds us of the classical Sardanapallos, and the tablet on which his name occurs belongs to a peculiar group, distinguished from all others in the Kouyunyik collection by their style of writing and expression. They begin with the words: "O Sun-god, great lord, I beseech thee; remove (our) sin." Two tablets of this group (K 4668 and S 2005) were published by myself for the first time in 1877, in the Appendix to my Babylonian Literature (pp. 78–82). I there pointed out that they belong to the closing days of the Assyrian Empire, and that the Esar-haddon mentioned in them must be a later king than the Esar-haddon otherwise known to history. I have since seen no reason to change my opinion. Before examining their contents, however, it is as well to translate such portions of them as give a continuous sense.